Please note – Seating for Blue and Gold section is on a first come, first serve basis for each game. Only tickets purchased in the White Section will have a specific assigned seat for the entire season. Purchase of your reserved seat DOES NOT include game admission fee. That you must pay in addition to the cost of your reserved seats. Game tickets can be purchased at the gate the day of the game. We highly recommend the purchase of “The Sports Boosters Family Card”. This card allows you and your immediate family entry to all home sports events throughout the year with the exception of post-season playoff and tournament matches. 100% of the proceeds from the sale of the Booster Family Card are utilized to support our award-winning sports programs at Oak Ridge. Purchase your seats and parking by clicking here! And Don’t Forget to Reserve a Parking Spot! Tired of trying to find a parking spot at our always popular games? 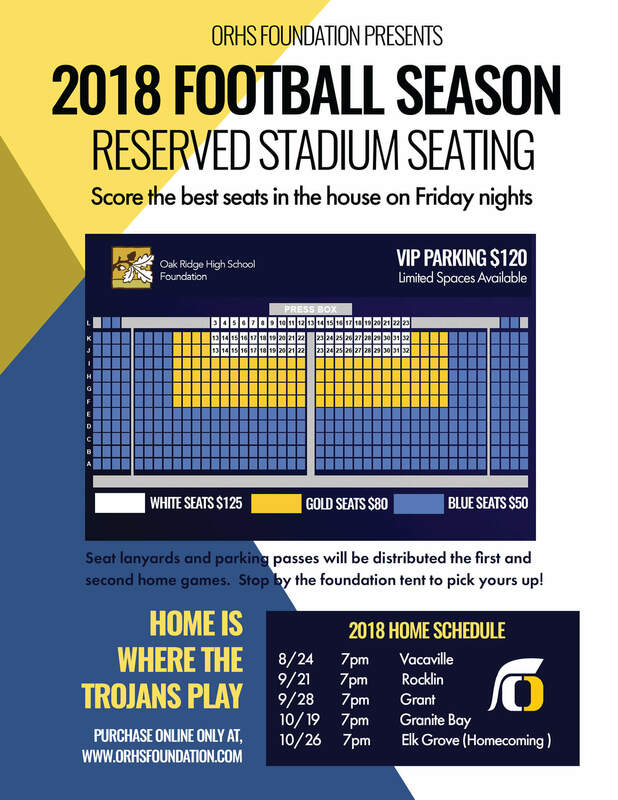 Once again, the Oak Ridge High School Foundation is providing reserved parking at all home games. Parking is up close to the entry home gate on the north end of the home bleachers. $120 gets you one of these prime, and very limited, spots so order yours early! They will sell out! You will need to show proof of purchase at the first game to receive your “Reserved Parking” Lanyard. Please feel free to email Billie West at Billie@TheTshirtGuy.com for any further questions. No Need to Rush to Get A Parking Spot!